Thanks to Stephen Howard and Rosemary Deller at the LSE Review of Books for allowing us to repost this review of Socrates Tenured. Funding is being cut from humanities departments. Tenure-track jobs in philosophy are drying up. Governments and funding bodies are increasingly demanding that the research they fund delivers clear and measurable ‘impact’. Our globalised, technoscientific culture is throwing up a host of urgent ethical, political, even existential questions. Any answers we have come from technocrats or Silicon Valley technologists, futurists and entrepreneurs. In this context, the mainstream of philosophy is failing to address its own impending crisis or enter these major discussions. Philosophers are indulging in insular debates on narrow topics, writing only for their peers: the result of a natural-scientific academic model that encourages intense specialisation. This, crudely put, is the bleak context that Robert Frodeman and Adam Briggle present at the outset of their lively and provocative new book. In response, Socrates Tenured: The Institutions of 21st-Century Philosophy offers an argument for a reconceived conception of philosophy for the twenty-first century. The thesis can be summarised as follows: philosophy must escape its primarily departmental setting and its primarily disciplinary nature to become ‘field philosophy’. The argument emerges through the book’s curious layered structure. The general thesis is stated upfront, with layers of support and detail added by the subsequent chapters. This structure risks being repetitive, but the quality of the writing prevents the reiteration of the core thesis from becoming tedious, and the central notion of ‘field philosophy’ shimmers into shape by the penultimate chapter of the book. Part One diagnoses the current crisis in philosophy as double-edged. On the one hand, the discipline finds itself in an institutional setting—the neoliberal university—that is increasingly hostile to the prevailing model of philosophy. In a world of shrinking budgets and ever greater demands for return on investment and direct societal impact, professional philosophy’s self-conception as the pursuit of disinterested, pure thought for its own sake seems increasingly passé. On the other hand, the mainstream of philosophy is failing to engage with the major questions of our times. The debate over our technological modernity takes place in magazines and blogs, in what the authors call our ‘latter-day Republic of Letters’. Insofar as academics are consulted for help with answers to contemporary societal challenges, it is scientists and economists who tend to be called upon. Part Two evaluates three attempts to remedy this predicament. These are the ‘applied philosophy’ that first appeared in the 1980s, environmental ethics and bioethics. Only the latter provides a salutary example for Frodeman and Briggle’s field philosophy, which is finally outlined in Part Three. What, then, is field philosophy? It would see philosophers ‘escaping the department’. They would move between the university and non-academic sites: NGOs, laboratories, community groups, businesses, think tanks, policy units, and so on. Philosophers may be institutionally based in other departments: medicine, law, the sciences; or they might yo-yo between a philosophy department and wider society. This physical movement would be mirrored by an intellectual one: instead of consisting of closed debates among specialists, the content of the field philosopher’s work would to a great extent be given by the needs of the non-academic field to which they are seconded. 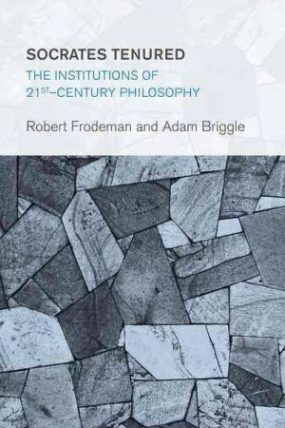 Frodeman and Briggle envisage the field philosopher in a dialectical movement, in both mind and body: between urgent, given problems and considered, rational reflection; and between the ‘fray’ of non-academic sites and the ‘armchair’ of the university. As the title shows, this represents a return to a Socratic ideal of the philosopher, embedded in the polis and attuned to the needs of their time. Frodeman and Briggle acknowledge that this might be seen as a capitulation to neoliberal demands for immediate economic utility. True, many of their statements about the ‘hand-waving’ response of professional philosophy to the demands for increased accountability are not as far from neoliberal critiques of the ‘useless’ humanities as they might be. There is a much-cherished idea that the very conduct of non-utilitarian, specialised humanities research itself represents a performative resistance to a neoliberal agenda. But the authors’ main point is that philosophy should be more pluralistic. Alongside ‘pure’ philosophical work – which might continue in the wealthiest universities, most independent of external pressures – Frodeman and Briggle wish to see alternative models of the figure of the philosopher, which can include the non-disciplinary field philosopher. Yet a potentially important issue not broached by the authors is: what gives the philosopher the right to pronounce on societal, non-academic issues? Without explicit justification, philosophers appear to risk suggesting that it is simply because we think we’re smart. Admittedly, Frodeman and Briggle insist that the field philosopher’s engagement should be ‘interstitial, horizontal, and reciprocal’, and they give an example of a modest, semi-successful philosophical mediation between community groups and utility companies in a debate over an environmental energy plan. Nevertheless, such a justification of the philosopher’s input seems to me necessary, and I have two suggestions. Firstly, we might point to the resources that philosophical history offers those who have studied it. This is not just the common, narrow defence of secondary school philosophy as providing tools for logical analysis. Rather, we might point to the synthetic approach to previous systems and ideas that characterises thinkers from Aquinas to Kant to Deleuze. A further resource is the sensitivity to rhetoric and context-sensitive argument, which we see in philosophers like Leibniz or Arendt. Secondly, we might indicate recent examples of philosophical public intellectuals, who do indeed conceive of their work as an engagement with given societal problems. I am thinking not of purveyors of inoffensive, philosophically-tinged panaceas, such as Alain de Botton, but instead the likes of Foucault or the Frankfurt school. Both of these points serve to underline the fact that it is particularly contemporary Anglo-American analytic philosophy that is the target of Frodeman and Briggle’s critique. While the authors acknowledge that the predominant Anglo-American, disciplinary version of continental philosophy has also become inward-facing and exegetical, we might emphasise that the engaged ‘field philosopher’ is perhaps not such a new figure but was rather active in pre-war, wartime and post-war France and Germany, and has not yet died in the French-speaking world (and tiny pockets of other countries), at least. Nonetheless, Socrates Tenured offers a bold diagnosis of philosophy’s malaise and a proposed means to escape it: whatever your view of the proposals, they are worth exploring and debating—even, perhaps, outside of the academy. Good book, good review. Effectively what I and some others have already done. To the letter pretty much. in my case illness and other factors I think did mould my trajectory somewhat.